Opera Mini Tops 30 Million Users, But Is It The World's Most Popular Mobile Browser? There is no question that mobile browsing is taking off. The latest data from Opera shows that nearly 32 million people used its Opera Mini mobile browser in August, 2009, a 147 percent increase over the year before. 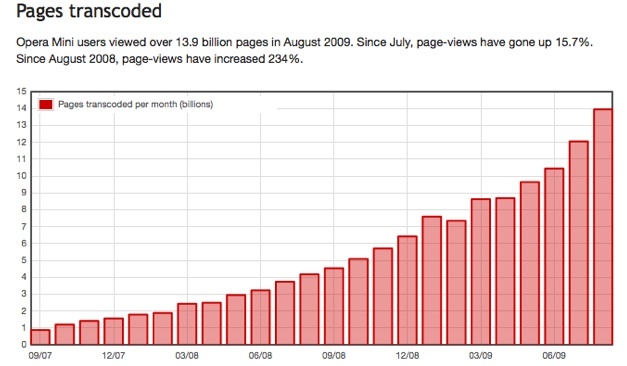 In terms of pageviews, Opera Mini delivered 13.9 billion last month, a 235 percent annual increase. That means that each person is loading 436 pages a month on their cell phones, or 14 a day. A year ago, Opera Mini users were uploading 323 pages a month, or 10 a day. So both the number of people browsing on mobile phones and usage is going up. But is Opera Mini the “world’s most popular mobile browser,” as Opera claims in a press release? What about the mobile version of Safari, which is the only browser allowed on the iPhone or iPod Touch. Apple has sold a total of 50 million iPhones and iPod Touches (30 million iPhones, and 20 million Touches), which both come with the Safari mobile browser. How many of those people actively browse the Web in any given month isn’t exactly clear. StatCounter gives some indication. It currently shows Opera with 26 percent share of mobile browsers worldwide, followed the iPhone with 21.8 percent. But it also shows another line for the iPod Touch at 9.7 percent. Add up those two, and you get 31.5 percent. Of course, the iPhone and the iPod Touch aren’t browsers, they are devices. What we really want to compare is Opera Mini versus Webkit, which underlies both the Safari mobile browser and the Android browser. Webkit’s market share would be even higher than Safari’s. Thereis also a geographic difference. Opera mini seems to be more popular in Europe and Russia, particularly on Nokia and Sony Ericsson phones. On those devices, Opera Mini provides the best mobile browsing experience. But overall, it is a stretch to say that it is more popular than Webkit or even just mobile Safari. And let’s not forget all the Internet-connected apps on the iPhone and Android as well. One day, app developers will decide to escape that walled garden, and then mobile browsing will really take off.